July was nice and cool; I could wear almost any perfume from my collection though some of them didn’t feel right even with weather permitting. Almost all perfumes I wear1 are those for which I own either a full bottle or a decant so I do not worry any more about not paying enough attention to them. I am trying to slow down with my perfume purchases. One bottle per month, as somebody suggested in my June stats post, seems like a reasonable goal (in theory, at least). I almost met it! If not to count a small bottle of ISA that I bought for sentimental reasons, I got just one bottle: Field Notes From Paris by Ineke (as always, if anybody wants a decant at cost contact me). 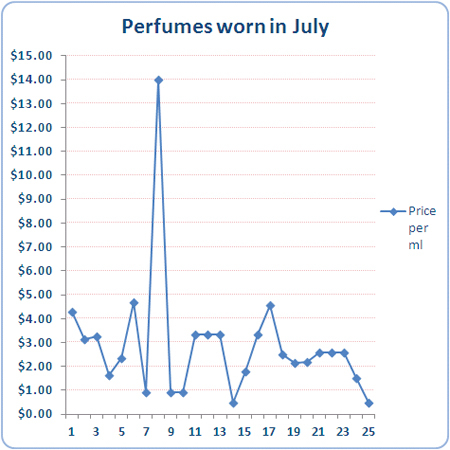 This month I decided to chart price per ml of perfumes I wore. I took an MSRP price for 100 ml where available and calculated for the rest. If not to count the parfum (Chanel No 19) that is clearly the most expensive per ml (~$14), the next one is By Kilian’s Love & Tears ($4.70), Neela Vermeire Creations’ Bombay Bling! ($4.55) and Amouage’s Beloved ($4.30). On the other side of the distribution, the cheapest perfumes I wore were Yves Rocher’s Nature ($0.50 – though now it’s impossible to find it at this price) and Hugo Boss’ Deep Red ($0.50). The median price for the perfumes I wore in July was $2.60/ml. I can’t say I enjoyed the most expensive ones more than the rest. * Perfumes I tried for the first time and liked: too many to list, it was a good month. Of the top of your head, what is the least expensive perfume in your collection that you love and wear? I love your stats. They are always fun to read and they generally prompt me to want to do the same. But alas, I never do! My cheapest fragrance would be Rose D’Homme by Les Parfums De Rosine. Which for some reason is one of those fragrances that I always forget how much I like when I wear it, but then months go by before I wear it again, only to discover again how much I like it. Hmmm, maybe I’ll wear it today! I’m sure you’re not and I refuse to believe that I am! I enjoy your stats! I’ve never figured the cost per ml of my favorites, though I have a relative scale in the back of my mind for them. Ines de la Fressange (the Calice Becker one from 1999) cost me $17 for a 30ml bottle and is wonderful. Mauboussin is terrific and inexpensive as well. Sonoma Scent STudio is a great deal across the board. My Tom Ford Black Orchid Voile de Fleur was very inexpensive when I bought it, but now has become scarce and much pricier. I had to clarify that my question was more not about the price paid (then gifted bottles would be the cheapest) but an average price for which the perfume is available to buy now. I agree that SSS’s perfumes are a very good price for the quality. Wow! Fascinating stats! I never thought of that before . . . Cost per wear, the least expensive fragrance I have is Diptyque’s Eau Particulière. First of all, the bottle is ginormous. Secondly, I scored it at the Diptyque sample sale for $65!!!! Nah, deals & steals do not count! :) I was curious to see which actually inexpensive perfumes my blogo-friends love and wear. A wonderful fun read. One purchase a month? Is that possible? Oh I know I need to put the breaks on too. But not yet! Off the top of my head the cheapest fragrance that I love would be Ulysse by Vicky Tiel. Love the stuff and it only cost twenty bucks. I’ve never heard about Ulysse or Vicky Tiel before. I see that it’s really inexpensive. Is it sold anywhere in real stores or is it only online now? I can only find it on line. I got mine at Amazon. There is a female scent as well called Sirene and Venus as well. I did run across Venus at Burlington Coat Factory. The cost per ml statistic kind of scares me, I have to say. ;) I do not want to know on some of the perfumes I own (though in some cases, the number is staring at me from your statistics, b/c either I have the same perfume or I have a perfume where I know the cost is the same). I think I wear and enjoy some pretty inexpensive perfumes (actually inexpensive, not great deals when on sale). Deep Red (bottle is on its way), Bronze Goddess, Champagne du Bois. And the “regular” non-exclusive Guerlains are really not so expensive. Oh, and the one I was just posting about yesterday – Dita von Teese. That’s positively cheap. No 19 parfum’s ppml has caught me off-guard: I’ve never thought it was that expensive. On the other side, I also enjoy those perfumes you mentioned. Deep Red is just great. I’ll buy the next (third) bottle once I’m done with the current one. My least expensive perfume is my bottle of Par Amour Toujours by Clarins, which I love to wear in the summertime. It’s a refreshing little girly thing I get a lot of compliments on, and I spent a whole whopping $16 for it at Winners. I noticed that not too complicated light perfumes usually get more compliments than those complex ones that I really love. Enjoyable stats post as ever, Undina! Sounds like your strike rate for discovering new perfumes to love was pretty high this month (and costly as result no doubt). My cheapest perfume is Cuir de Lancome but I don’t know if you’re counting evilbay. This is an interesting new twist to your stats, Undina (charting the price per ml of the ones you wore). My favorite cheapie this summer, and what a good question, is Ineke Ruhland’s Briar Rose for Anthropologie 50mls for $ 32.95. Slightly boozy roses with a chocolate note in the dry down. Uncomplicated but nice and lasting. You got it on sale! It’s a half price. Still good, I’m glad you like it. I’m waiting for those garden curiosities in small bottles packaged as books – they are so cute! Caldey Island Lavendel GBP 24 (shipping included in Europe) is good stuff, calming and very wearable. I’m sooo not into “all-natural” anything that I’m probably the last person to give advices on that topic. But I can tell that I love DSH’s Vert pour Madame (I own a bottle of it) and I’m seriously considering buying a couple perfumes from her The YSL Retrospective Collection – The Beat Look and Ma Plus Belle Histoire d’Amour.